On 12 January Bombardier Transportation delivered the first Innovia APM 300 train to the city of Shanghai, China. 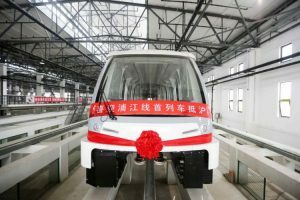 The vehicle is part of an order placed in June 2015 by Shanghai Shentong Metro Group Co. Ltd. for a turnkey driverless system including 44 trains. The system will enter service later in 2017 on Shanghai Metro’s Line 8 Phase 3 Project, a new 6.6 km, dual-lane elevated, driverless metro system that will connect the residential district of Pujiangzhen to the Line 8 interchange at Shendu Highway Station. The vehicles are paired with the Bombardier Cityflo 650 CBTC system. Bombardier has already supplied its Innovia APM 100 technology to China with one system in Beijing and another in Guangzhou. To date, Bombardier and its joint ventures have delivered, or are in the process of delivering, 1,608 metro cars to Shanghai Metro. They are also responsible for the maintenance service of most of these metro cars.